Posted in Indie Polish, Manicures, Nail Art, pictures, reviews	by Jessica W.
You know what’s funny about this manicure? I didn’t realize until after I picked the polishes and started doing my nails that all three polish names sort of go together: Eternal Sunset, Sunrise Funfair, and Winged Cupid. 😀 LOL I’m also a super smarty pants and didn’t write down any notes for this. Uhhh oops? Okay, let’s check this mani out! Pahlish Winged Cupid is a blush-toned scattered holographic nail polish. I’ve used it underneath Grace-full Eternal Sunset on my ring and pinky fingers. I’m fairly sure that I used 3 thin coats. Femme Fatale Cosmetics Sunrise Funfair is a really pretty pink-orange polish with golden and green shimmer. I know that when I applied it, I was thinking it was a thermal (spoiler: it’s not). So when it didn’t change colors, I was super confused. LOL. Anyway, if memory serves me correctly, I’m sure that I did 3 thin coats plus top coat because it applied a bit unevenly. 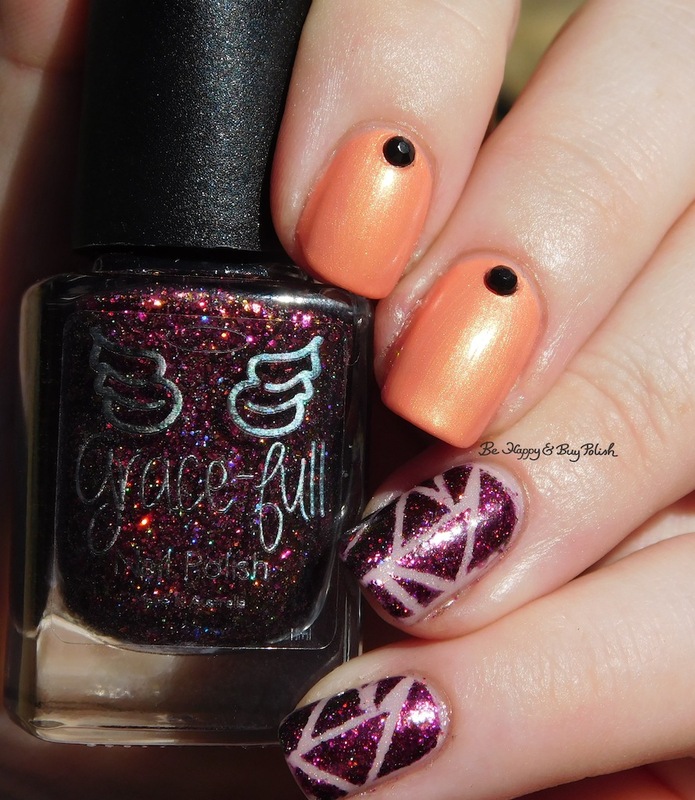 Grace-full Eternal Sunset was a Hella Holo Customs Polish that I picked up. It is a purple base polish with copper, gold, and fuschia flakes and holographic glitter. I really enjoyed watching the colors change and flash on this one. I used a nail vinyl pattern and sponged Eternal Sunset over it. Lastly I applied a black gem on my index and middle fingers. My husband said it kind of made it look “bug-like” but I think it added a nice touch. I like the design you got using striping tape. Oooo…I love the look of Winged Cupid as the base!